Perma Bitu Coat is a dark brown liquid, which turns black upon drying. It is used in waterproofing and protection of subsoil structures from chloride and sulphate attack. Perma Bitu Coat is used for waterproofing all type of RCC, brickbat coba, asbestos cement sheets and zinc/aluminum sheets etc. 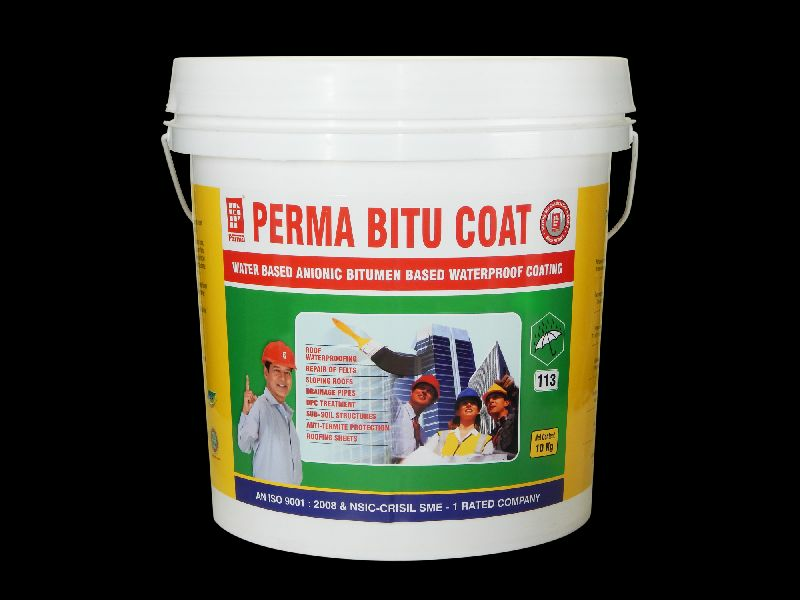 Perma Bitu Coat can be used for repairing the damaged bitumen felts, cracked stoneware drainage pipes. As damp proof course applied under the first layer of bricks or blocks work in the masonry. As waterproof coating externally applied on the basement walls, footings etc before back filling. As anti corrosive and anti-termite coating in all subsoil structures before back filling. As crack filler and repair water proof coating on brickbat coba and on brickbat coba and on concrete roofs. Bitu coat is water based and hence not messy like conventional bituminous products. Bitu coat is has high PH and hence more compatible with concrete. No Cleaning solvents are required and can be washed off with water when it is still wet. Packing : Perma Bitu Coat is supplied in 500kg, 1kg & 10Kg. Packs.